The Kilkenny Food Festival just over - we are being treated with another one. 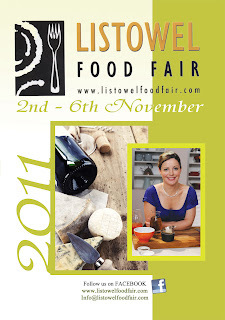 This time in Kerry, Listowel to be precise. Starting today with the judging of the best emerging food product award - it is worth a visit. As I still have to work for a living (I know, it's a nuisance sometimes), I will have to skip the Kerry Food Hero Award this afternoon as well as the National Farmhouse Cheese Competition tomorrow morning. If you can make it tomorrow evening, you will be able to watch Catherine Fulvio cooking up a storm.